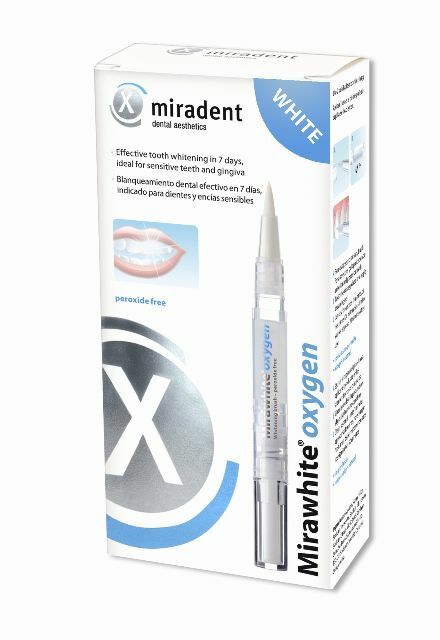 The Mirawhite oxygen whitening pen contains a peroxide free gel for gentle and safe tooth whitening. The mode of action of MIrawhite oxygen bleaching gel is based on Ardox-X technology, which increases the oxygen content in tissue. It causes no damages or sensitivities of teeth or gingival and can be applied even if there are existing gingival problems. Unlike products containing peroxide, Mirawhite oxygen will not soften bondings of fillings or roughen the tooth enamel. Mirawhite oxygen is applied with the brush twice a day, in the morning and evening after tooth brushing. If used as directed, the first whitening results can be achieved after one week and whitening up to 5 shades can be achieved within two weeks. Mirawhite oxygen is also great for on the go touch-ups because rinsing is not required and treatment can be discontinued for one or more days. However, the best result is achieved with continuous application.